Vitamin Pets are a weirdo garage rock band from Boone, North Carolina. 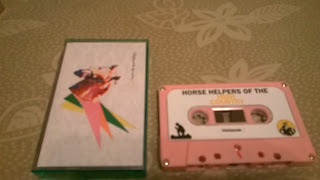 Oddly enough, although I got this tape to review at random I lived in Boone up until last year while attending school. They were just getting started as I was on my way out of town, so I never saw them play a show. Now I kind of wish I did. Not all college town bands are created equal. Some are better than others. Vitamin Pets are one of those that makes the “better than” side of that statement. Side A starts with a theme song that is heavily indebted to Southern gospel and Appalachian folk music but soaked in irony. It’s a fun, lighthearted way to start the tape. They later revisit their folk influences on the side B song “Dig a Hole” in a much more sincere manner. In general, the whole tape felt like a tale of two sides to me. Side A featured a lot of talking, spoken word, and distorted audio over the instrumentation and singing. Sometimes multiple voices were layered on top of each other in a way that made it hard to keep up with. While that is probably what they were going for, it got even more untenable to keep up with when samples and original audio were spliced into sound collages. These were somewhat amusing but didn’t really do much else. The highlight of side A was the song “Forrest/Mountain”. It was unspoiled by the audio catharsis occurring around it. The B side felt like a reward for getting through all of that. Vitamin Pets prove they can be a serious band when they want to be. “Ya-Ya-Ya”, “Cement Shoes”, and “Dig a Hole” are all extremely solid. The closing track, “I am Ed Sullivan”, was a bit weird but felt a lot more structured and deliberate than the weirdness from side A.